Trotter Racing :: Empire Gets The Job Dunn! Empire Gets The Job Dunn! Empire Liberty struck 3rd up at Cranbourne on Friday Night in the 1600m National Jockey's Trust maiden. Well handled by Dwayne Dunn who took over the reigns with the suspension of Dale Smith, he took the initiative to send the stylish 3 year old son of Statue of Liberty forward from the outside barrier to sit just off the lead. With the down grade to a heavy 8 and first use of the track it was a winning move as Empire Liberty stuck to his guns all the way to line holding off all challengers. 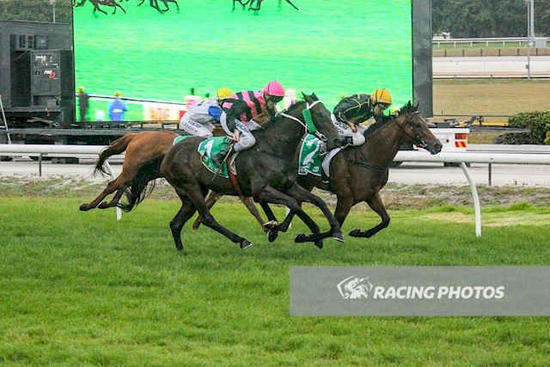 He certainly put the writing on the wall last start in a strong maiden beaten only 1.65lengths and the 7 day back up, step to the mile, combined with added fitness did the trick. Great result for his big team of owners many on track to cheer him home. As has been written previously his initial campaign yielded 3 duck eggs and on face value it would have been easy to dismiss him as a potential future winner if not aware of the bad lack that he endured. The stable was confident that he had plenty to offer and his first up 2nd vindicated the faith in him further enhanced by his close up run 2nd up and finally the elusive maiden on Friday Night. Still a work in progress and the stable is of the belief that whatever he does this time in is a bonus as he has plenty of scope for improvement once he fully furnishes and matures.